says Al G. Wright, the band director who convinced an outstanding Colorado twirler to come to Purdue in 1954 and, by doing so, created a golden legacy for Purdue University and the Purdue “All-American” Marching Band. 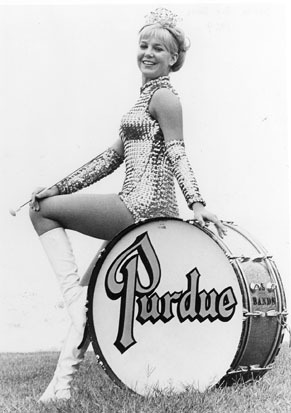 It was the pizzazz of a great twirler, with a great personality, that Al G. Wright wanted to put in front of Purdue fans that Fall – and Juanita Carpenter was picture perfect for that role. 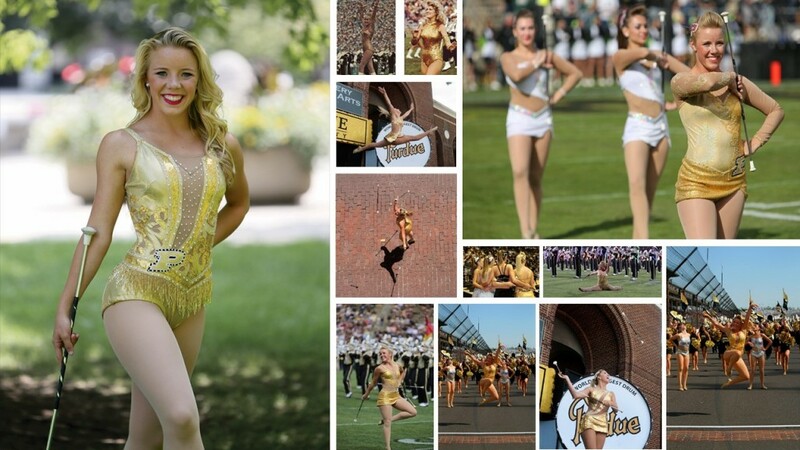 Mid-way through the first season she got a nickname – Golden Girl – and by the time she graduated two years later, the notion of putting one of the nation’s best twirlers in front of the band, as Purdue’s Golden Girl had become a tradition. 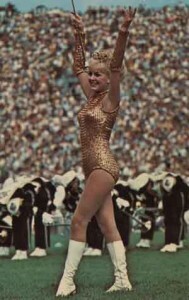 Juanita’s sequined costume which boasted a high neck and a skirt, shocked some in Ross-Ade Stadium who were used to majorettes performing in slacks and long-sleeved jackets. But fans loved the charismatic twirler. When the band paraded to Ross-Ade Stadium, “ roses were thrown at her,” recalls Gladys Wright, Al G. Wright’s wife. At the Purdue vs. Notre Dame football game in 1958, Golden Girl No. 3, Addie Darling, brought national attention to the position of “Golden Girl.” The atmosphere in South Bend was already hyped that day and everyone wanted to catch a glimpse of Addie like she was a rock star. The Purdue flag corps lowered their long, spear-tipped poles to a horizontal position to form a barricade as the band and Golden Girl marched into the stadium. At halftime, Wright asked Addie to perform on top of an old bass drum on the field. “You get on the drum so I know where you are,” he recalls saying to her. The result caught the eye of TV cameramen and created a media sensation. All of a sudden, throughout the country, headlines were written about the Golden Girl. The United States Twirling Association bolstered the tradition professionally when it selected the Purdue band to make the recordings it distributed to twirlers nation wide. “If you participated in the USTA, you had to use that recording with the Golden Girl’s picture on the front and that gave us a lot of publicity among twirlers,” Wright says. All of these things shaped the Golden Girl’s status as a Purdue icon, which found its reflection in popular culture. For years, the Indiana maps handed out at Shell gas stations had a Golden Girl icon denoting Purdue’s location. Many little girls grew with one dream in mind – to become Golden Girl. “At the age of three, when I first began twirling, I wore a gold sequined costume and had jet black hair. I told my mom and my aunt that someday I would be the Golden Girl. They thought it was cute, but never really thought about it again because I had black hair. The day I came home with blond hair my family knew that the little three-year-old wasn’t kidding,” says Kimberlie Ratcliffe who became Purdue’s 16th Golden Girl. Throughout the Wright era every Golden Girl had blond hair. Most Golden Girls have been blondes, but throughout the years, directors have not been as adamant about hair color and three Golden Girls – Dawn Vardaman, Erin Ansfield, and Katie Schleis – have twirled as brunettes. Twirling costumes have changed with fashion trends, but have always been a dazzling gold. The skirt disappeared from the costume by the late 1950s, and a tiara replaced the tall, awkward hat. In recent years, Golden Girls have abandoned the tiara, but the feeling of being royalty persists. “The Golden Girl at Purdue is truly the ‘queen of the nation’s baton twirlers’ because she is treated like royalty wherever she goes. She is not only the top twirler for the Purdue Band, but an ambassador for the university,” says Sally Batina, Purdue’s 12th Golden Girl. The Golden Girl and other twirlers have led the band for 47 Indianapolis 500 Festival Parades, two Rose Parades in Pasadena, CA, and an Inaugural parade in Washington D.C. “At the presidential inaugural in January 1989, it was so cold I wasn’t sure how I was going to stand the temps – much less twirl. But as soon as we were on the parade route, the people cheered so loudly for us that I soon forgot about the cold. And when we reached the Grandstand, I performed a few tricks and waved to the Bushes – and was so proud when George Bush waved back!” recalls Dawn Beck, Golden Girl No. 15.